Curiosity Travels is about a 20-something on a continuous journey to see the world through the eyes of an expat. After college, Jessica moved to Seoul, South Korea for two years to teach English. She now lives and blogs about life in Spain were the wine is cheap and life is more laid back! 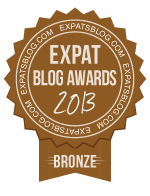 ExpatsBlog.com Expat Blog Awards 2013: Spain Bronze Award! Awesome stuff!! I love this blog! Nice, honest, good writing and great layout!! Keep it up buddy! Love this blog! Super informative and honest!! Great job of finding those out of the way places. Definitely on my list. Love this blog!! Very informative and great anecdotes. Curiosity Travels gives me a lot of inspiration to keep traveling and many helpful tips on what to do, where to save, and good things to look out for when making my own memories on the road! I love reading this blog! Great tips, beautiful pictures and fun stories. Curiosity Travels always motivates me to go out and find my next adventure!